Just walking down a British high street it’s clear to see that every major store is now filled to the brim with new season collections—and this means only one thing, summer is just around the corner. If you’re anything like us you’ll be chomping at the bit to go wild with a total wardrobe re-vamp and then totally regret it when you check your rather bruised bank account. Well, at Who What Wear UK we’re all about finding those must-have pieces at seriously low prices, under £50 in fact in this instance, that go the distance, being chic and useful way beyond one wear. We’ve scoured not only the best of the best—Mango, H&M, Topshop, Arket and more—but we’ve also turned to some of our favourite designers to see what you can actually get for under £50, and we believe you’ll be pleasantly surprised (erm, hello new Ganni floral tote and Castana espadrilles). 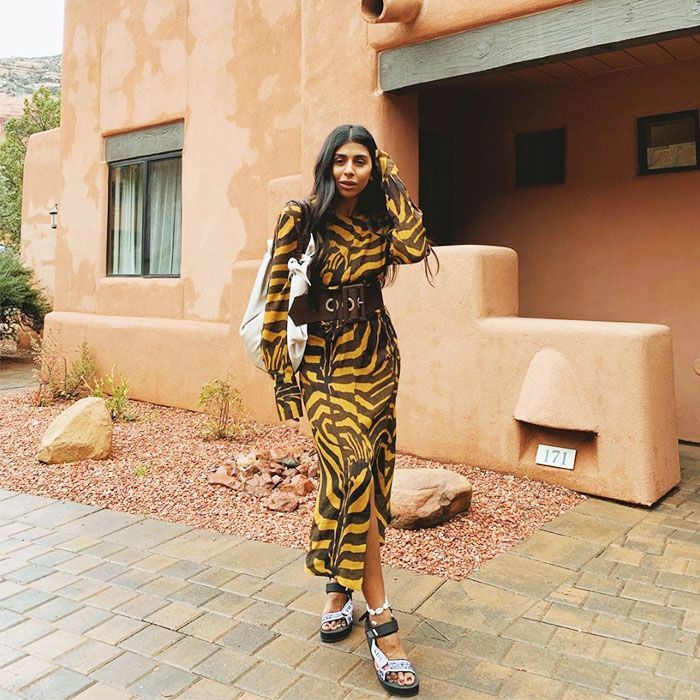 Monikh—someone who we follow for sophisticated affordable finds as well as more expensive ones—proves that the high street offering has a lot of classics in addition to the big trend-hitters. We can't wait to get our hands on her new season H&M zebra stripe dress, for example, but if you want a plainer option you'll find it too. Keep scrolling for my top 30 under-£50 shopping picks this month. Dip into this spring's all-beige trend for work with this button up shirt. Keep it tonal and team with a lighter shade of tailored trousers. These shells and stones look so precious. The perfect tailored cream blazer has just landed in time for spring. Thanks, H&M. If you're doing raffia for summer (aren't we all?) then make sure it looks and feels super substantial, like these seriously chic slides. The grown-up gap year trend is happening, and this dress could pass as something we've spotted on the runway. Castana's have just dropped by 50% in price over on The Outnet and just in time for summer. Snap these up quick before they go! We still can't believe we've found a beaded bag this good from the high street. If you love the utility trend you'll definitely want this. Team with a plain white tee as things get warmer. These are so perfect they're keepers. Short's are going to be summer's surprise smash and we're persuaded by this tailored pair that have just the right amount of stretch in to wear comfortably all day. The ugly sandal is back, and this raffia pair is the perfect way to ease yourself into this trend for summer. A very welcome staple to both minimalist and maximalist wardrobes. If there's one thing you buy from this list, it should definitely be these. A key summer accessory that could pass for vintage designer. This Ganni tote is a total steal at £35—excellent for travelling. This skirt is screaming summer to us, and the print is totally spot on. The skinny straps are key in making sandals look expensive. These are a bargain at £17 and will go with just about everything. Statement white blouses are going to a key go-to for summer, we're loving the fashion edge this ASOS number has. Initial pendants are going nowhere, we're obsessed with this affordable price tag. The Breton top will never looks is credibility. An all time wardrobe staple everyone must have. The Scandi brand everyone is talking about is actually super affordable. Midi skirts are the spring must have item and we're all about quality. This shape is super key for summer and we're thrilled this one is actually affordable! Zara have just nailed the naked sandal trend. This is giving us summer party vibes. Team with a barely-there sandal and cute mini basket bag. Crochet + tortoiseshell = our dream combo. Finally! A great pair of tailored trousers that aren't in designer price bracket. This top is super cut for summer nights out and the colourway is right on trend.